FREE VALUATION. To buy, auction, sell or consign your Flown Mercury lapel pin that is for sale, please email Nate@NateDSanders.com or call the Nate D. Sanders Auction House (http://www.NateDSanders.com) office at (310) 440-2982. Project Mercury was the first U.S. program that launched humans into space and took place between 1958 and 1963. As an integral piece of the space race between the U.S. and Soviet Union, its goal was to orbit the Earth before the Soviet Union could. The Mercury Seven included astronauts Alan Shepard, Gus Grissom, John Glenn, Walter Schirra, Donald Slayton, Gordon Cooper and Scott Carpenter. There were six manned missions of Project Mercury and all were successful. We sold a Project Mercury flown pin owned by Scott Carpenter at auction for $1,230. Carpenter piloted the fourth Mercury flight, known as the Mercury-Atlas 7. Carpenter made three orbits around Earth, and was the fourth American to fly in space. Please see below for lot details of the Scott Carpenter flown Mercury lapel pin. Project Mercury Flown Pin. Click to enlarge. Lapel pin flown aboard the original Mercury capsule, along with a 24 November 1962 typed letter from astronaut Scott Carpenter which reads in part: “…Enclosed is the capsule lapel pin Joe gave me all wrapped up on the morning of my flight…It flew with me, as the corrosion will attend and I hope you will accept it back as a token of my deep gratitude for all you did for me while we were getting ready…” It is signed, intimately, “Scott”. 8″ x 10.5″ letter has expected creases from folding but is otherwise in very good condition. Sold for $1,230. FREE VALUATION. 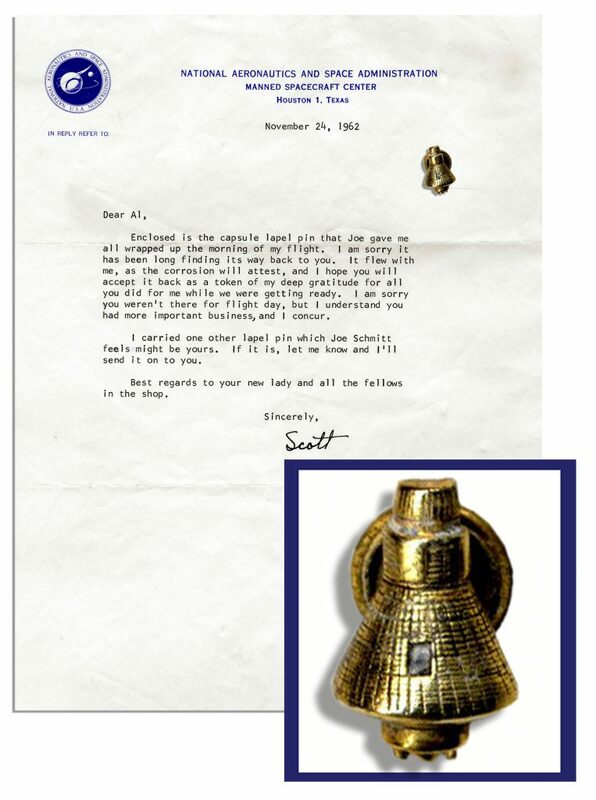 To buy, auction, sell or consign your Flown Mercury lapel pin or other space flown memorabilia that is for sale, please email Nate@NateDSanders.com or call the Nate D. Sanders Auction House (http://www.NateDSanders.com) office at (310) 440-2982.